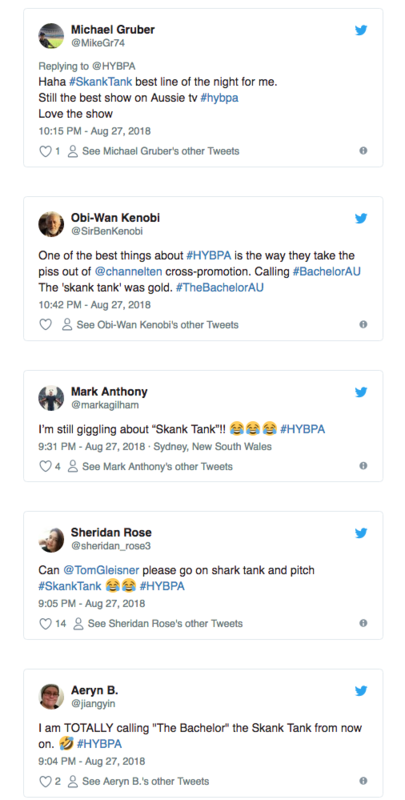 Comic Tom Gleisner could well be getting an invite to Network Ten’s HR this morning after he used a skit on last night’s Have You Been Paying Attention? to roast the network’s popular dating show The Bachelor. During the episode, Gleisner announced to the contestants that the next segment’s questions would concentrate on the ‘Honey Badger’ and the bevy of ladies vying for his affection. “It is The Bachelor time,” Gleisner declared before adding: “Or as we call it here – Skank Tank!” Ouch! Network Ten has not responded to the segment. It’s been somewhat of a tumultuous season for 2018’s The Bachelor with claims its chief protagonist, Nick Cummins, was to blokey and lairy for the role and was proving a turn-off for some viewers. Female contestants on the show have also claimed in the media that Cummins had admitted using his appearance on the show solely to advance his media profile and for the money. In Cummins’ defence, yesterday media reports suggested that he’d legitimately joined the show in the hope of finding true love and has apparently agreed to legally marry his chosen pick live on air during the show’s upcoming finale. Meanwhile in other Bachelor news, there is now a concerted social media campaign to make Australia’s most famous convicted drug smuggler, Schapelle Corby, star of the next The Bachelorette Australia. A Facebook page has sprung up petitioning Network Ten to consider the 41-year-old Corby to score the coveted role. To date, the page has over 21,000 supporters in just a matter of days. The Facebook description reads: “The Bachelorette needs to represent the true, everyday woman. A woman that knows the ups and downs of world travel. “A woman that has a strong sense of family. A woman that is independent, strong and isn’t afraid of getting her hands dirty. Corby has not responded to the campaign nor is it known if she would even consider the role or is even single at present.